Unfortunately, I don't think the dump you uploaded is what we want to look at. If you google the bluescreen message, it should give you a pretty good idea what you're looking at. Download the bluescreen viewer from here http://www.nirsoft.net/utils/blue_screen_view.html (Zip at the bottom of the page) and run the program on the affected computer. it will allow you to view the bluescreen info. Once we have that, we can probably have a good go at pinpointing it. Thanks, my problem is software related... So I probably need to do a reinstall, never done one before and I'm nervous but I guess everyone needs to learn to do it at some point. Have you really eliminated the hardware possibilities? RAM and PSU are the most common hardware problems, although overheating may cause it too. Are the fans working? Also before you reinstall MAKE A BACKUP OF YOUR DATA. With this said you should also download DRIVERS for your PC before doing the reinstall. Some laptops for example use a network driver that is not available on Windows so you won't have network access to download any other drivers until that is installed. So you better have it handy BEFORE a fresh install. What is the fault specifically? it may be trivial to fix. If you are having trouble finding drivers, driverpacks.net is a good place to look. The Bluescreen is reporting the ATI3diag.dll is the cause of your problems. This is a Graphics card driver file. Download the latest drivers from the net for the graphics card. See if you still get the Blue screens. If not then try installing the Graphics card again but dont install the drivers yet. Check the bios, make sure it's using the Graphics card, not the onboard graphics. See if you get the Blue screens when running the graphics card using windows (default) drivers. If not then I would try installing the graphics card drivers downloaded from the net, rather than the ones on any CD or DVD install disk. Hopefully that will solve the Blue screen problem. BTW, all the websites I looked at for your graphics card say it's Nvidia based, not ATI. Not sure why an ATI driver would be required for an Nvidia based graphics card. 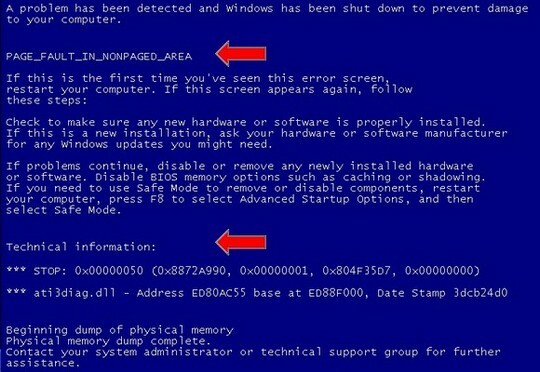 MaxLV: The Bluescreen is reporting the ATI3diag.dll is the cause of your problems. This is a Graphics card driver file. I have had blue screens on idle before. Was the cpu fan throttling back and not cooling the other stuff enough. Try winding all the fans to full speed always in the bios and see if it helps. I did touch the other mobo heat sinks and they were leave marks on finger hot when the cpu fan was just idling along. You can try looking at the dumps using BlueScreenView. It's not showing any program-related info in the dump you provided, so I think it is hardware related and not software. richms: I have had blue screens on idle before. Was the cpu fan throttling back and not cooling the other stuff enough. I use a Noctua CPU cooler, and by the quality of it I doubt it would let my temps down. However I did in fact undervolt the fan using the low noise adapter which is now taken off. Jarno: You can try looking at the dumps using BlueScreenView. It's not showing any program-related info in the dump you provided, so I think it is hardware related and not software. Are you sure? I thought it was corrupted windows files? Well, I've done a reinstall, I've also set my CPU fan to stock speeds. Nothing is over clocked, so all thats left is the CPU, RAM, motherboard and other hardware things, so I've trimmed it down. If its hardware related the components are on warranty, so not going to drain me of all my money.